Is there an airport near the ranch? Yes: the nearest airports are in Cody, Wyoming or Billings, Montana. Will my son participate in daily prayer? Yes: we require all the boys and staff to pray the Liturgy of the Hours in the morning and a Rosary in the evening, regardless of religious affiliation. Our program is centered upon a belief that daily prayer is the pre-eminent foundation of all human happiness and fulfillment. Will my son attend Church services? Yes: we require that all the young men at Triangle Cross Family Ranch attend the weekly Catholic Mass at Our Lady of the Valley parish here in Clark, Wyoming or in Montana. Weekday Mass attendance is optional and depends on availability. Although we are Roman Catholic, we will accept boys of any other creed, color, nationality, or religion. What curriculum is recommended at Triangle Cross Family Ranch? We recommend that the parents enroll their child in the Our Lady of the Rosary home study program. Our Lady of the Rosary is a correspondence school that offers complete teacher services, texts, lesson plans, workbooks, tests, grading and full diplomas. We can also accommodate any other pre-arranged curriculum. Consult our “Parent Handbook” for more information. Do all the troubled youth on the ranch attend school? Not necessarily: academic enrollment is based upon the length of stay and the wishes of each boy’s parent(s). What is the recommended length of stay at Triangle Cross Family Ranch? It could happen quickly depending on how long it takes to fill out the application, and send your deposit to reserve your son’s space. Usually three days to a week. When do you take applications for your Triangle Cross Boys Ranch? Applications are processed year round. What type of boys come to Triangle Cross Family Ranch? To ensure that our Bunkhouse is a safe environment for your son, we do not accept boys who are a danger to themselves, others, our livestock, or our property. We determine the eligibility of each child who comes to our ranch during the initial phone interview, at which time we review the boy’s behavioral history and his mental disposition. What are the ages of the Troubled Youth you serve? 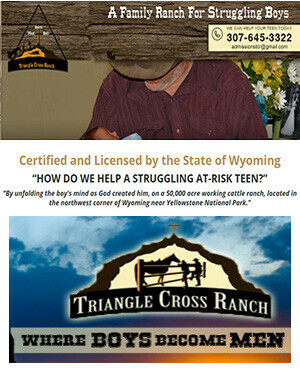 Triangle Cross Family Ranch serves young men between the ages of 10-17. What are the requirements for admission to Triangle Cross Family Ranch? • Admission fee and first month payment given upon arrival. • Health care insurance and medical needs. • Individual educational plan related costs. What is included in the monthly tuition cost? • Daily supervision, mentoring, and vocational training from the Triangle Cross Ranch staff. • Access to recreational equipment, indoor sports center, and mechanical roping steer. • Daily devotional books and materials. Admissions Fee of $2,500.Monthly Program Fee: $5,300 per month. Please keep in mind, a phone interview is still the best way to see if your troubled youth will be helped at Triangle Cross Ranch. Call us now at 1-307-213-7116.